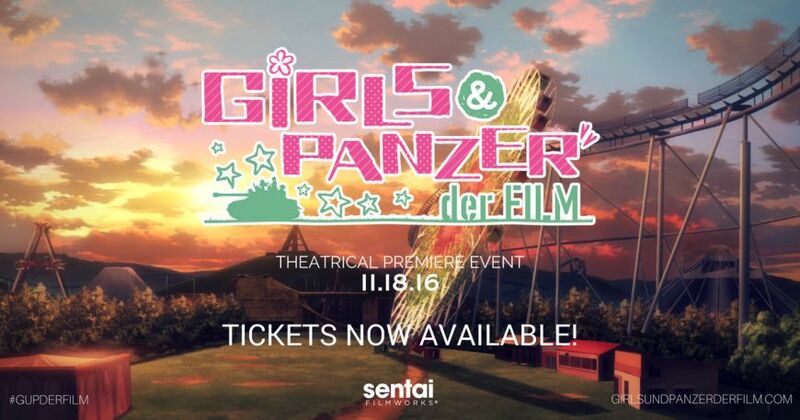 HOUSTON, November 1, 2016 – Sentai Filmworks, a leading independent distributor of Japanese anime and pop culture programming, announced today its U.S. release schedule for the English-dubbed, critically acclaimed, and record-breaking Japanese anime film, Girls und Panzer der Film. Girls und Panzer der Film will screen in more than 30 markets, including: New York, San Francisco, Houston, Dallas, Boston, Seattle, Orlando, San Diego, Sacramento, and more. Girls und Panzer der Film picks up where the successful television series, Girls und Panzer, left off: in a society where humanity exists in cities built atop gigantic carrier ships. Now the girls of the Ooarai High School tankery team must pull together to defeat their foes and save their beloved school. The movie, released in 2015 in Japan, was ranked the highest-grossing movie of its opening weekend and earned more than $24 million (USD) total at the Japanese box office. The film won the prestigious Seiun Award Best Dramatic Presentation and the Sanctuary Award from the 25th Japan Movie Critics Award. The English-dubbed movie is directed by Kyle Colby Jones, whose credits include No Game No Life, Parasyte –the maxim-, Akame ga Kill!, and Monthly Girls' Nozaki-kun. Additionally, Margaret McDonald (Miho), Rebekah Stevens (Yukari), Jessica Calvello (Saori), Caitlynn French (Hana), and Molly Searcy (Mako) reprise their roles from the TV series. Sentai Filmworks tapped Los Angeles-based distributor, ELEVEN ARTS, for their U.S. roll-out. “We believe in connecting exceptional and distinguished films to audiences around the world, and we think anime fans will thoroughly enjoy Girls und Panzer der Film,” said Ko Mori, CEO and President of ELEVEN ARTS. NEW PEOPLE (1746 Post Street), a 20,000-square foot entertainment complex that promotes the latest in Japanese popular culture expressed though film, art, fashion, and various events. In addition to the movie, attendees will receive exclusive swag, participate in a Q&A panel with key film staff, and more. For Sentai Filmworks’ latest announcements regarding this and other great titles, be sure to like us on Facebook, and follow us on Twitter and Instagram. ELEVEN ARTS is a Los Angeles based film production/distribution company known for distributing high quality Japanese films, live-action and animation, to North American audiences. ELEVEN ARTS’s major live-action titles include: Japan Academy Awards winner Memories of Tomorrow (starring Ken Watanabe) and Oscar nominated director Yoji Yamada’s samurai film Love and Honor. ELEVEN ARTS' anime titles include: DIGIMON ADVENTURE tri, CHAPTER 1: REUNION, the Evangelion franchise, Fullmetal Alchemist: The Sacred Star of Milos, the Puella Magi Madoka Magica franchise, Blue Exorcist: The Movie, Expelled from Paradise, The Last: Naruto the Movie, Boruto: Naruto the Movie, and The Anthem of the Heart. For additional information: www.elevenarts.net. Join the fandom and follow us on Facebook Twitter & Instagram.